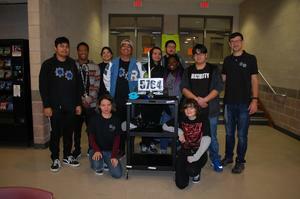 Congratulations to the Reagan Robotics team on placing First in their division at the Austin Metro League Robotics competition Saturday November 10, 2018 at Dripping Springs High School. After a paralyzing first match, SpaceBoi the robot, rose to victory under the direction of drivers Nicolas Mendez and Dennis Ringler. Coaches Rodney Salter and Zahra Frymire gave critical advice just-in-time to ensure SpaceBoi held onto the lead. Congratulations to the whole Blue Sabers Robotics Team for a great first meet of the season, and we look forward to your next competition, December 8th at Vandegrift High School... GO BIG BLUE!! !